Hayley Westenra's pitch-perfect pipes propelled her to international stardom at the age of 16. Rebecca Lo catches up with the London-based singer as she prepares for her debut concert in Hong Kong. The female voice has never failed to thrill. Perhaps because it is usually the first sound we hear: our mother humming lullabies as she cradles us in her arms. For Christchurch native Hayley Westenra, her earliest memories of music were all about her family. "When I was a child, my parents used to put on classical music tapes when I couldn't fall asleep at night," she recalls. "They left a big impression on me. Also, when we would go down to visit my grandparents, my granddad would play the piano or the piano accordion and my nana would sing. Those are wonderful memories that I hold onto." The 26-year-old New Zealander has been performing for most of her life. After first stepping onto the stage at the age of 6 to star in a Christmas school play, she began recording at the age of 12 and landed a deal with Decca Records while still in high school. Soon, she was performing all over New Zealand and cutting record deals. Pure, her 2003 CD featuring classical and light pop songs alongside traditional Maori ballads, remains the fastest-selling international debut classical album to this day. Westenra is a natural performer, and has crossed over from her classical music roots to include New Age and Celtic in her repertoire as her voice matured. "I had some mentoring from a very well-known New Zealand opera singer, Dame Malvina Major, when I got my record contract," she notes. "With her, I learned a foundation that I have built upon. I then reached a point where I could have taken a more operatic path or a more natural singing path. I chose the natural singing path, which still requires technique, but I've put my emphasis on holding onto the voice that I feel is mine." Westenra has since performed for countless heads of states and dignitaries, including former US president George W. Bush and Queen Elizabeth II. But she has a special place in her heart for a charming Italian crooner and their duet in her hometown. "My most memorable performance would be performing with Andrea Bocelli in Christchurch," she remembers fondly. "He was one of the singers who inspired me when I was growing up, and I used to sing along to his album Romanza all the time. It was very surreal being onstage with him and, in a way, introducing him to the home crowd. It was overwhelming." Despite, or perhaps because of, her celebrity status, Westenra does what every other 20-something does when she isn't touring. This helps her prepare for concerts and keeps her grounded. "I take joy in everyday things, like putting together a nice meal or catching up with friends," she says. "Because I travel so much, I enjoy the simple things - even just doing the washing. "To prepare for a concert, I think it's just a matter of keeping the mind and body fit. It's a personal thing. For me, it's fresh vegetables. I also drink a lot of water, because usually I'm flying in for a concert and I may be quite dehydrated. And I wouldn't have a chocolate smoothie before I go onstage - I'm more of a herbal tea girl." 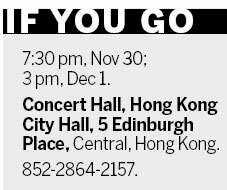 Although Westenra has performed in China many times, the two concerts at City Hall will be her first time singing for Hong Kong audiences. "I'm so excited to be finally holding a concert in Hong Kong," she says. "It has been a number of years since I've been there and it's a place I adore. "I've really enjoyed all my trips to China. It's wonderful the connection that can be made through song. When singing in Mandarin in China, I feel a stronger connection with the audience. And it's fun, too. "What fascinates me is just how much I need music. It's a magical thing. In terms of performing, it's something that really keeps me alive and well. I don't know what I'd do if I didn't have singing and performing in my life." Contact the writer at sundayed@chinadaily.com.cn.